With two wood-burning fireplaces and both north- and south-facing views, the condo is a cozy mid-century-inspired hideaway in the thick of the action. 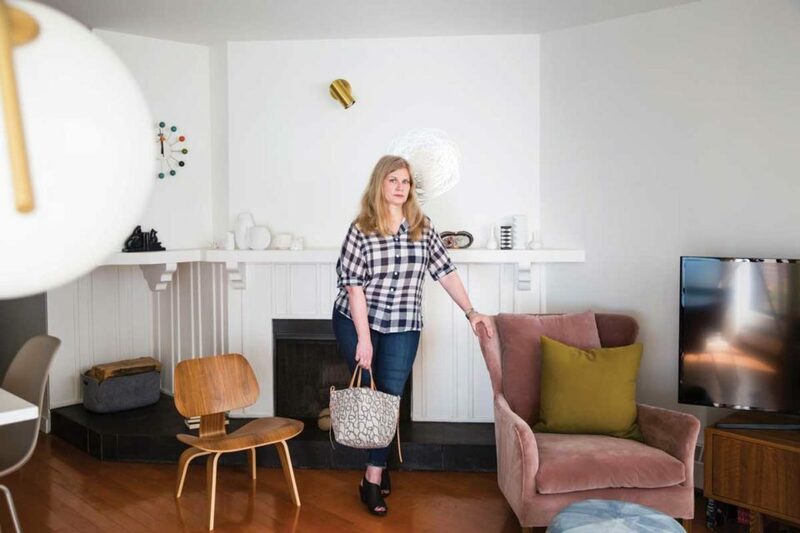 The luxe pink velvet Perez Chair from 4Living adds a warm pop of Sharon Schuld’s favourite colour to the crisp white walls and warm wooden accents. Photograph by Lori Andrews. When Sharon Schuld bought her Mount Royal condo in 1989, she knew she had found a treasure worth keeping. Schuld had always loved the area and knew it was where she wanted to establish her roots. Nearly 30 years later, her love of the neighbourhood and the condo has grown exponentially. 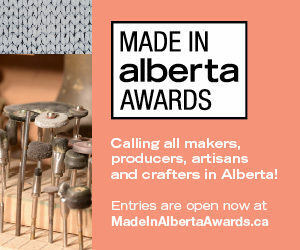 The avid knitter and owner of Pudding Yarn, a knitting, textile and needle-arts shop located just off 17th Avenue S.W., brings the creativity and passion she has for her work into the design of her dream home. The spacious two-storey unit that she shares with a tabby named Smish is a constant work in progress. 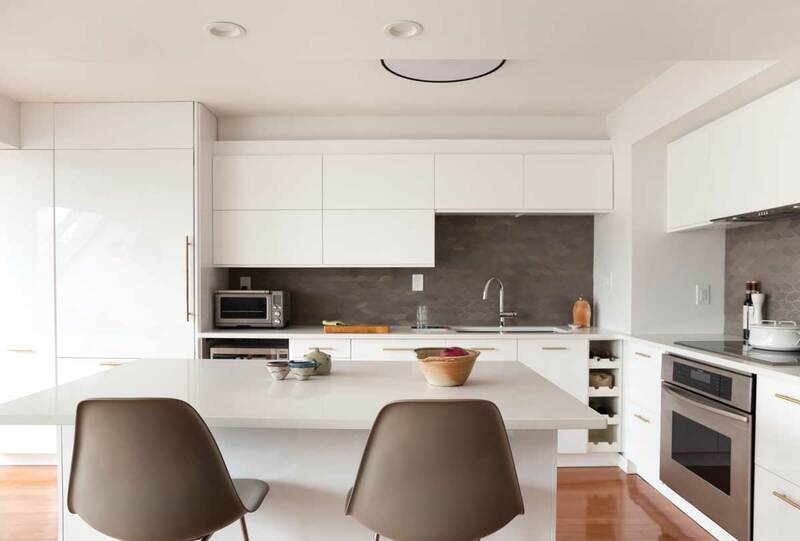 Most recently, Schuld completed an extensive renovation in the kitchen, transforming it into a place where she could entertain and cook for friends and family. Schuld hired a handyman to rip out the existing kitchen, which had an impractical dividing wall, and install white lacquered IKEA cabinets, opting for a brushed-brass pull on all of the lower cabinet doors and drawers. She added a large island to the space, allowing for extra seating and creating new boundaries with the open-concept living room. 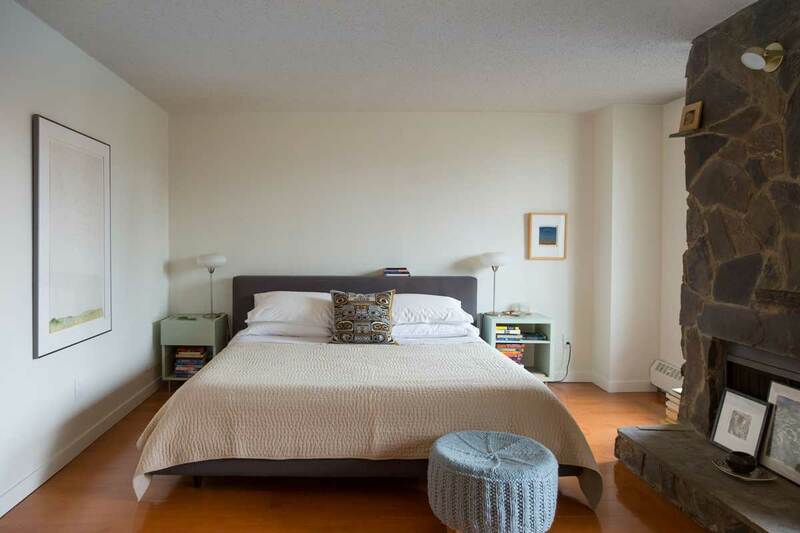 Upstairs, in addition to a home office and guest bedroom, Schuld has created a bedroom retreat for herself. The room looks out over the treetops and features a breathtaking view of downtown Calgary. The bright space extends outdoors with a sprawling north-facing balcony. The bedroom is where Schuld spends a lot of time poring over her extensive book collection, and it’s no wonder, as the second of the home’s two wood-burning stone fireplaces creates a cozy atmosphere on even the coldest evening. Living-room sofa from 4living; Throw pillows from 4living, Inspirati, Crate and Barrel and handmade by homeowner; Ottoman from 4living; Circus pouf by Normann Copenhagen; Perez chair from 4living; Eames accent chair from Kit Interior Objects; Lamps from Pottery Barn. The unique two-storey condo has slanted south-facing windows in the living room that fill the open-plan living space with natural light year-round. Photograph by Lori Andrews. Another look inside the living room. Photograph by Lori Andrews. Dining-room pendant light by Flos; Saarinen marble dining-room table from Kit Interior Objects. 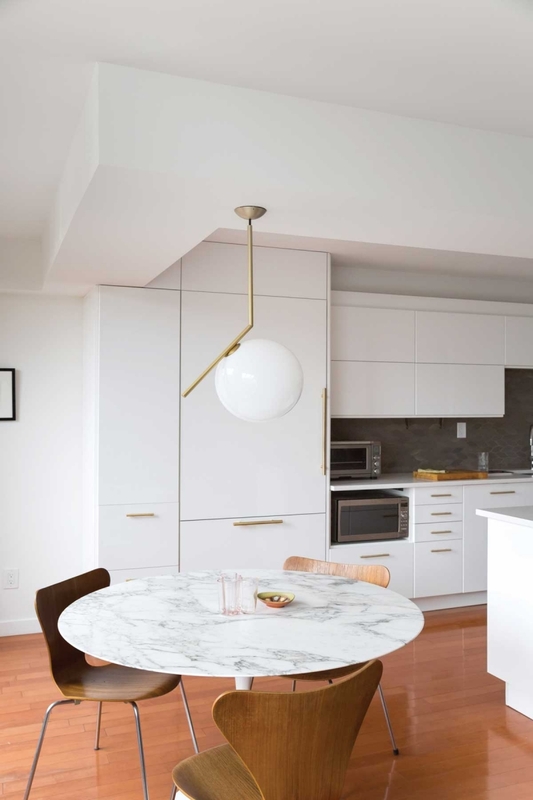 The small dining area makes a big design statement with its glossy marble Saarinen table and Flos brass pendant light. Photograph by Lori Andrews. Abstrakt kitchen cabinets from IKEA; Backsplash tiles by Heath Ceramics; Colonial bronze cabinet pulls from Banbury Lane Design Centres; Caesarstone kitchen countertops from IKEA; Eames island stools from Design Within Reach; Ceramics in kitchen and dining room by John Chalke from Willock & Sax Gallery. Schuld added a large island to the space, allowing for extra seating and creating new boundaries with the open-concept living room. Photograph by Lori Andrews. 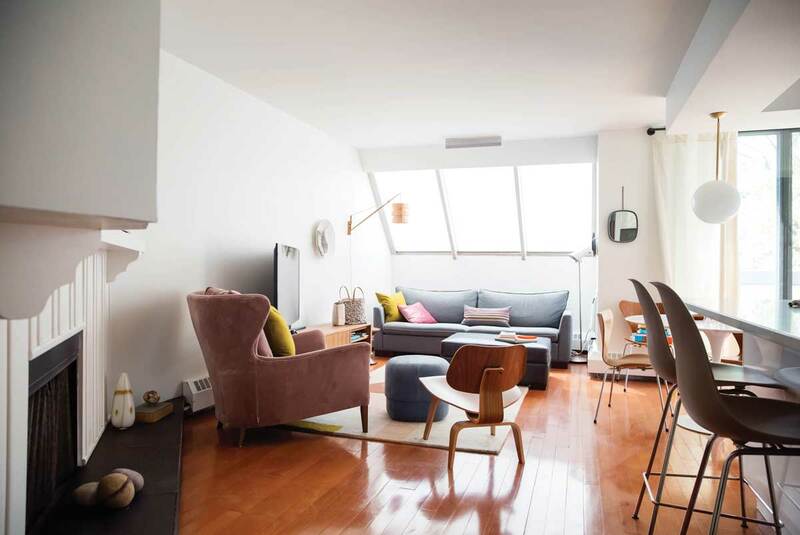 Having lived for 30 years in her two-storey Mount Royal condo, Sharon Schuld has curated a space that reflects her passions, style and personal-design philosophy. Here are some of her top tips. 4. Don’t buy the first thing you see. 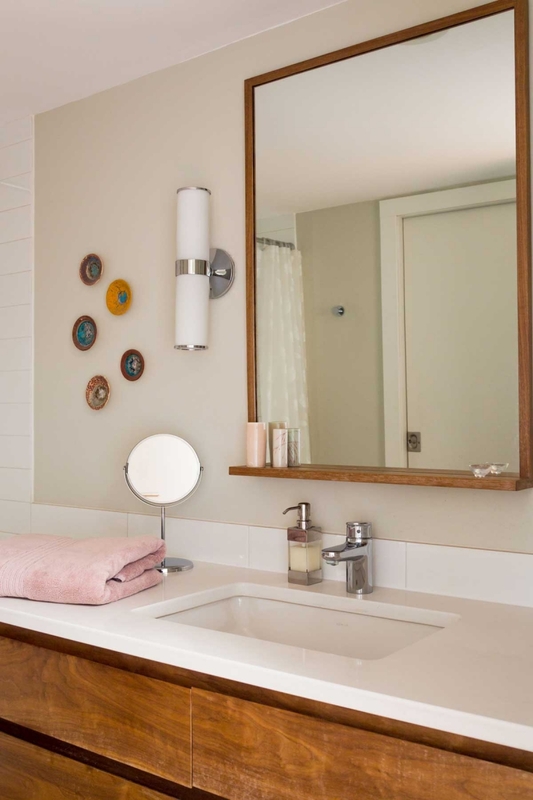 “Renovations are tricky because you want it to all come together seamlessly, but you should definitely contrast and compare your options for things like fixtures and appliances. Bedspread from Pottery Barn. Schuld has created a bedroom retreat for herself upstairs. Photograph by Lori Andrews. 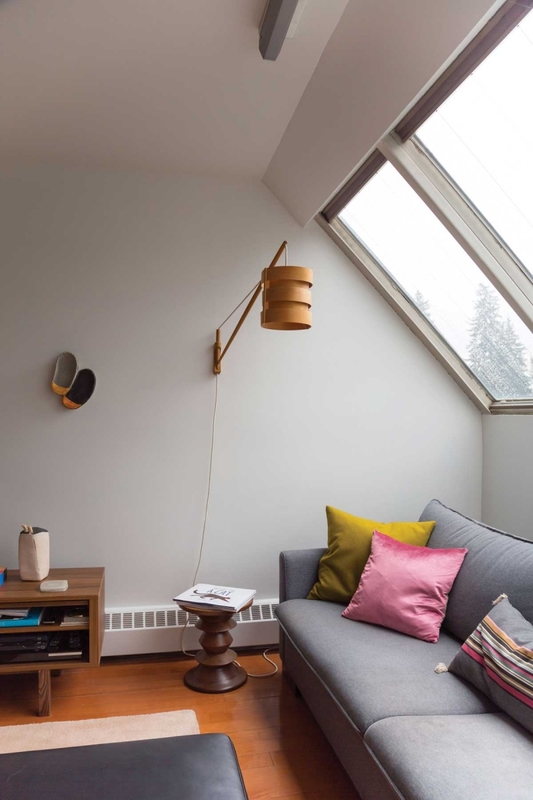 Bedroom lounge chair by Ligne Roset; Lamp on stone fireplace by Rich Brilliant Willing. 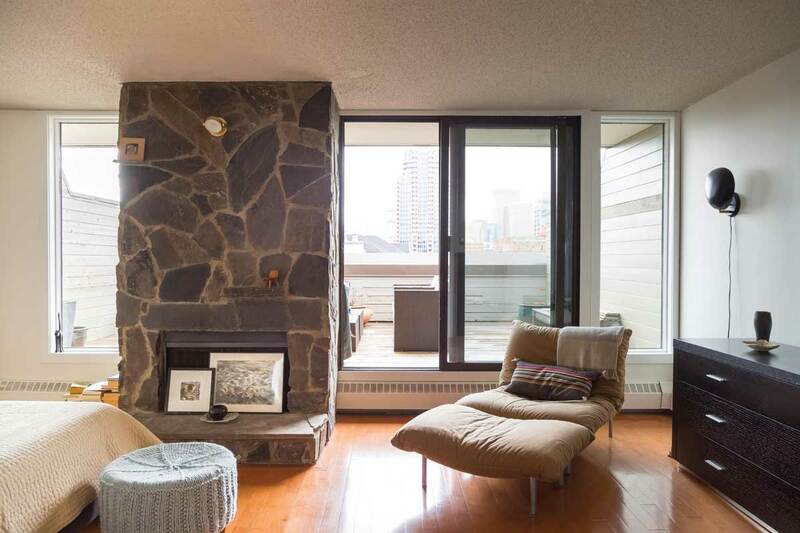 Perched on the second floor of the condo, the main bedroom features a wood-burning stone fireplace and steps out onto a spacious balcony with a view of downtown Calgary. Photograph by Lori Andrews. This article appears in the November 2018 issue of Avenue Calgary.